Put your patriotism in print with the best pre-event advertising you’ll find this summer! 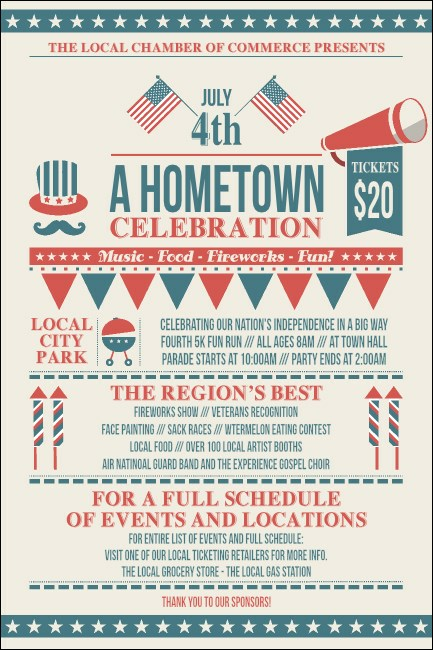 Promote your holiday event with pride when you post Fourth of July Hometown Posters in advance. This Poster template features a fun, bazaar-style design of American images in red, white and blue, including the stars and stripes of two American flags at the top. Celebrate our nation’s independence in style with TicketPrinting.com.